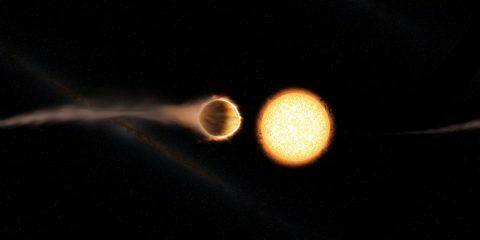 Reporting in the journal Nature, scientists used data from NASA’s Hubble Space Telescope to study WASP-121b, a type of exoplanet called a “hot Jupiter.” Its mass is 1.2 times that of Jupiter, and its radius is about 1.9 times Jupiter’s — making it puffier. But while Jupiter revolves around our sun once every 12 years, WASP-121b has an orbital period of just 1.3 days. This exoplanet is so close to its star that if it got any closer, the star’s gravity would start ripping it apart. It also means that the top of the planet’s atmosphere is heated to a blazing 4,600 degrees Fahrenheit (2,500 Celsius), hot enough to boil some metals. The WASP-121 system is estimated to be about 900 light years from Earth – a long way, but close by galactic standards. Previous research  found possible signs of a stratosphere on the exoplanet WASP-33b as well as some other hot Jupiters. The new study presents the best evidence yet because of the signature of hot water molecules that researchers observed for the first time. The phenomenon is similar to what happens with fireworks, which get their colors from chemicals emitting light. When metallic substances are heated and vaporized, their electrons move into higher energy states. Depending on the material, these electrons will emit light at specific wavelengths as they lose energy: sodium produces orange-yellow and strontium produces red in this process, for example. The water molecules in the atmosphere of WASP-121b similarly give off radiation as they lose energy, but in the form of infrared light, which the human eye is unable to detect. In solar system planets, the change in temperature within a stratosphere is typically around 100 degrees Fahrenheit (about 56 degrees Celsius). 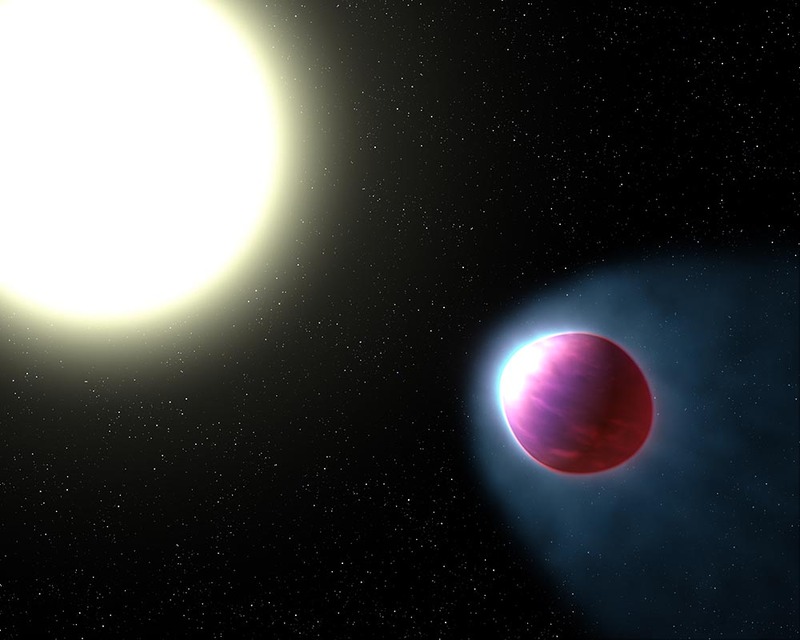 On WASP-121b, the temperature in the stratosphere rises by 1,000 degrees (560 degrees Celsius). Scientists do not yet know what chemicals are causing the temperature increase in WASP-121b’s atmosphere. Vanadium oxide and titanium oxide are candidates, as they are commonly seen in brown dwarfs, “failed stars” that have some commonalities with exoplanets. Such compounds are expected to be present only on the hottest of hot Jupiters, as high temperatures are needed to keep them in a gaseous state. The Hubble Space Telescope is a project of international cooperation between NASA and ESA (European Space Agency). NASA’s Goddard Space Flight Center in Greenbelt, Maryland, manages the telescope. The Space Telescope Science Institute (STScI) in Baltimore, Maryland, conducts Hubble science operations. STScI is operated for NASA by the Association of Universities for Research in Astronomy, Inc., in Washington. Caltech manages JPL for NASA.